God has chosen a garden to do some wonderful things for His Creation. And as God’s nature mandates, He desires the best and finest for and from His most prized possession. 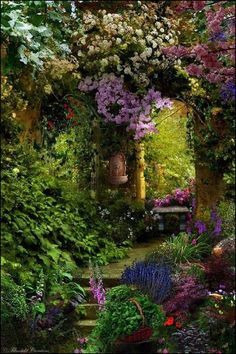 Humanity, the human soul, the crowning of all living things created were made in, made for and made to dwell in a garden. Let’s take a look. The Lord desires the best for us. He is not a grudging, harsh, unforgiving taskmaster. No, our God wants us to have the best, live the best and forever possess the best He has to offer. And it all began in a garden. It has been stated that the cross was not the place where Jesus died. It is understood that Jesus actually died in the Garden of Gethsemane. It was here where Jesus surrendered his human will (the spiritual man) to the Father. It was the cross where he surrendered his human body and blood (the physical man) for all of humanity. Jesus could not have endured the pain, humiliation and agony of the cross of Golgotha if he had not first died out in the garden. But, it does not end here. With God, He always saves the best for last. Let’s recap this thread of thought. First, God placed the first man Adam in a garden to live. Next, God placed the last man, Jesus Christ, in a garden to die. It is said that God is a God of principles and patterns. And this is apparent in how He from the beginning designed the path leading to salvation. The law of the Old Testament began and was fulfilled in a garden. In doing so, God used the garden as a pattern. The failure of Adam in the garden as recorded in the Old Testament was reconciled in a garden by the last Adam, Jesus Christ, recorded in the New Testament. We see that the Word of God opens with Adam living in the garden. Then we see the last Adam, Jesus Christ, lying dead in a garden. And lastly, we see him in a garden lifted up to eternal life. Living, lying and lifted completes the cycle. Is not God sovereign in all His ways? Is it not a wonderful thing how the Lord puts all of the puzzle pieces together to make His ways fit perfectly? There has never been and never will be a man who walked upon the dust of this earth like Jesus Christ. Jesus is perfect, pure and priceless. In conclusion, the garden is God’s plan for life. The garden of prayer was the gateway for Jesus to face his darkest moment. A garden supplied the strength he needed to carry the cross, and with it, the sins of mankind. Should it not be likewise for us? This post began with the opening verses to the song ‘In The Garden’. Jesus will never require us to bear a cross that He will not first prepare a garden to equip us to carry that cross, if we are willing to enter it.